Our week started with all things sweet and delightful…and we are definitely talking about the Kindergarten! On Valentine’s Day, we were very busy helping our sweet young things with their precious Valentine’s cards for their friends. We have to mention that we were very impressed with all of the printing of names which the children had independently completed. Quite a feat, as we know all too well the time, effort and care required in printing neatly a class set of names. All the cards were carefully tucked into the beautiful cardholders, with lots of treats and goodies, to take home and open and admire with families afterschool. Since we’ve been teaching Kindergarten, we’ve decided to have the children open their Valentine cards at home. Many children like to give a little gift with their cards, such as a chocolate or tiny box of stickers or tattoos. We know how sad the children can become if they lose track of the cards and small treasures so it’s best that the card opening happen safely at home. We had a delicious snack of cupcakes and fruit, thanks to our classroom parents. And for the rest of the week many of our children kept saying how February 14 was “the best day ever” at school so it looks like our Valentine’s affair was truly a sweet memory. We’ve so enjoyed the respite from the snow the past few days. How easy it’s been just to switch to rainboots (and sometimes not even those) and a jacket for playtime. We had a wonderful afternoon on Thursday with lots of children demonstrating their strength on the swings and how well they can “pump” after getting a big initial push from the teacher. We’ve been having lots of fun with our Alphabet as we motor towards the last few letters. 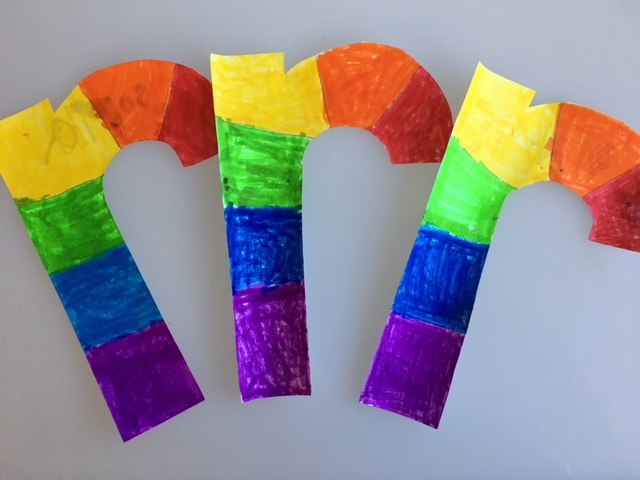 This week was r is a rainbow” and the children loved colouring them in and reciting the colours in order. As part of our Alphabet practise, we print the letter of the week in upper and lowercase, draw a few pictures beginning with that letter and label them. We also do a lot of brainstorming, encouraging the children to look around the classroom for environmental print from the multiple alphabets we have up in the classroom, think of words in categories (animals that begin with “r”? food? sports? numbers?) or the objects around them. The children love to print their own labels and we have really been emphasising over the last four weeks listening to the order of sounds in the words, particularly the CVC (consonant, vowel, consonant) words to spell words independently. For example, cat what’s the first sound? “c,” the second sound “a,” and the last sound “t.” We want the children to listen for those important first and last sounds of words. It also gives us an opportunity to talk about spelling patterns such as -at. We can generate a whole lot of words with that specific spelling patterns (bat, cat, fat, hat, mat, pat, rat, sat), but more practise with rhyme and manipulating the individual sounds in a word. We want to develop the children’s phonological awareness to help them be successful readers and writers. We’ve written about the importance of phonological awareness here. Library day on Tuesday! Don’t forget to return your books for book exchange. PE Days: Division 15 (Monday/Thursday), Division 16 (Monday/Wednesday). The children must have runners on these days!! Pink Shirt Day on Wednesday, February 22. The entire school is encouraged to wear pink shirts in recognition of anti-bullying. A white is shirt is ok too. Popcorn Sale on Friday, February 24. The Kindergarten will be participating so please send in $1 sometime this week so we can pre-order a bag for your child. It will be a fun Friday treat to have a popcorn snack outside with all of our Kindergarten friends.